U.S. Class and Component milk prices were announced for February on March 4. 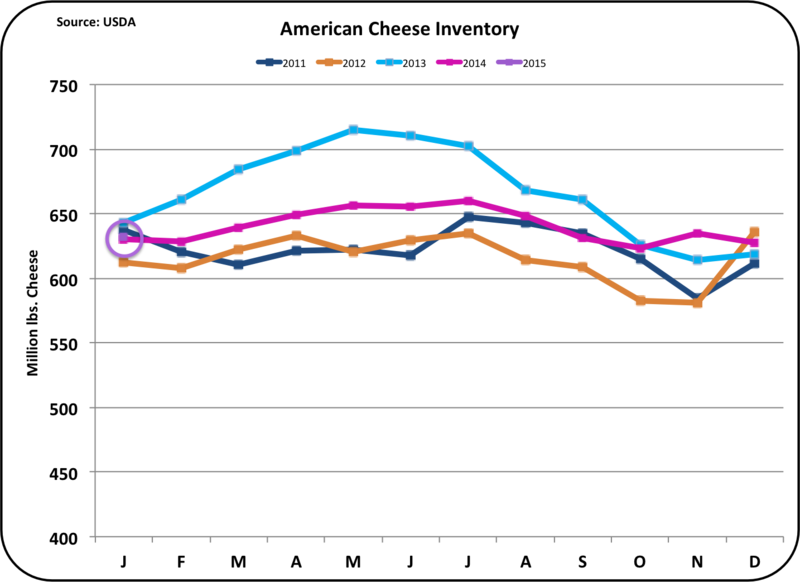 The Class III price was down slightly driven by lower cheese and dry whey prices. Butter was up, reaching $1.68/lb. Below are the pie charts of the components values as they relate to the makeup of the Class III price. 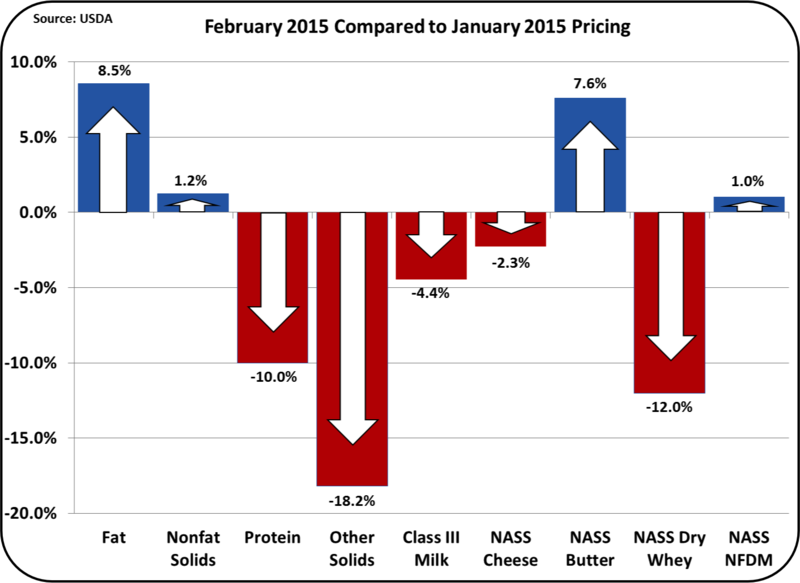 Other solids and protein both dropped 2% in the makeup of the Class III price. 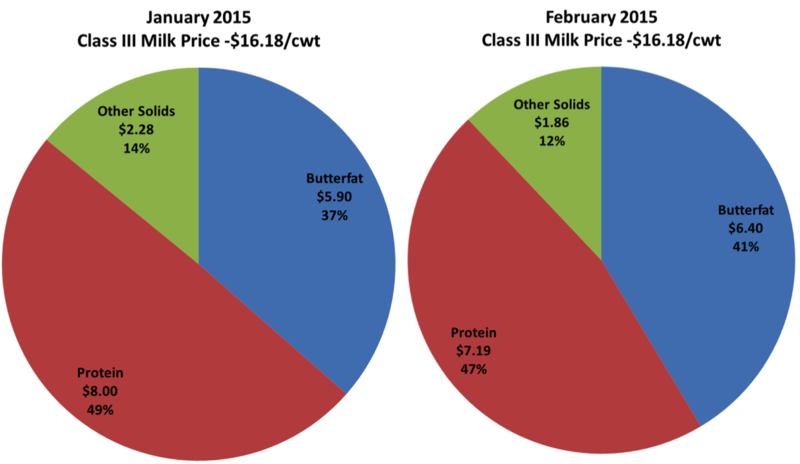 Butterfat increased in value significantly, increasing from 37% to 41% of the Class III value. This post will primarily review inventories of the commodities behind dairy prices. Inventory data always lags in reporting, so the most recent data is for the end of January 2015. Because January represents only one point on the chart, that point is accented with a circle. 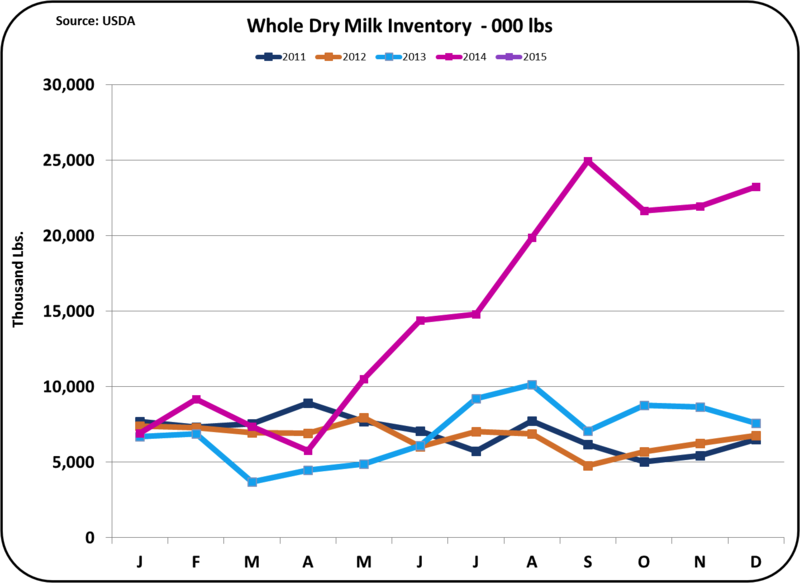 Commodity inventories for cheese, butter, dry whey, nonfat dry milk, and whole milk powder, are reviewed below. Whole milk powder is not one of the commodities that directly drive milk prices, but it is increasing in importance and will be reviewed as well. Cheese inventories are almost identical with the prior year, so it is surprising that the price of cheese has dropped 32%. The only rational conclusion is that there is concern that cheese inventories will increase causing a bubble in inventories and forcing a lower price. The most likely cause would be a drop in cheese exports. 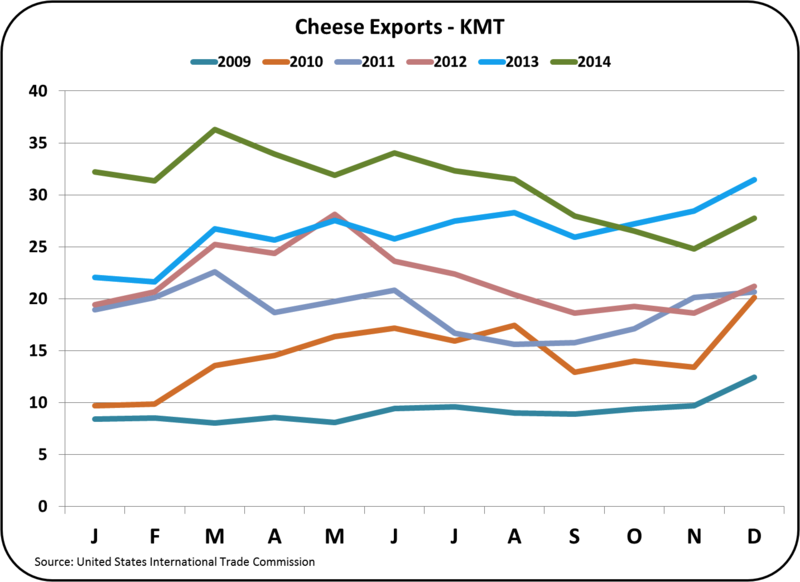 Cheese exports were below prior year in December 2014, but did show healthy growth for the year and good growth in the month of December. Concerns about a bubble in cheese inventories may not be justified. 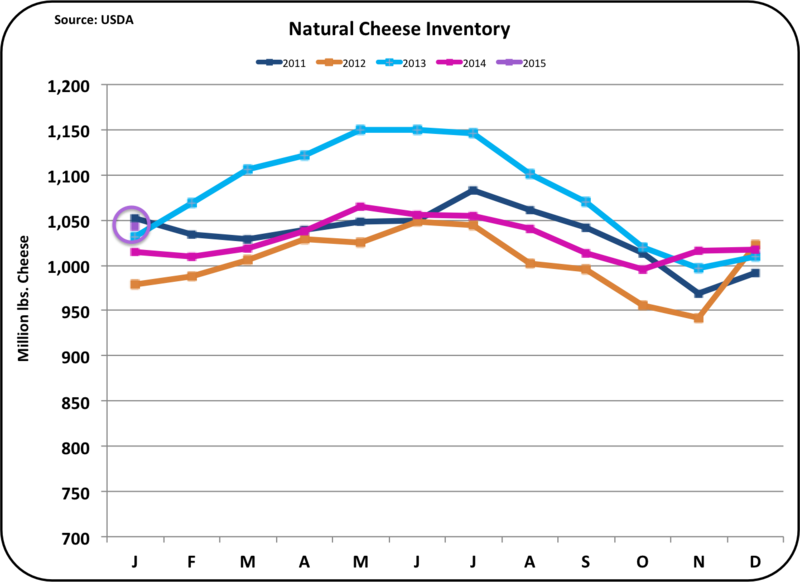 Part of the concern in cheese prices may be driven by the most recent cheese production statistics. 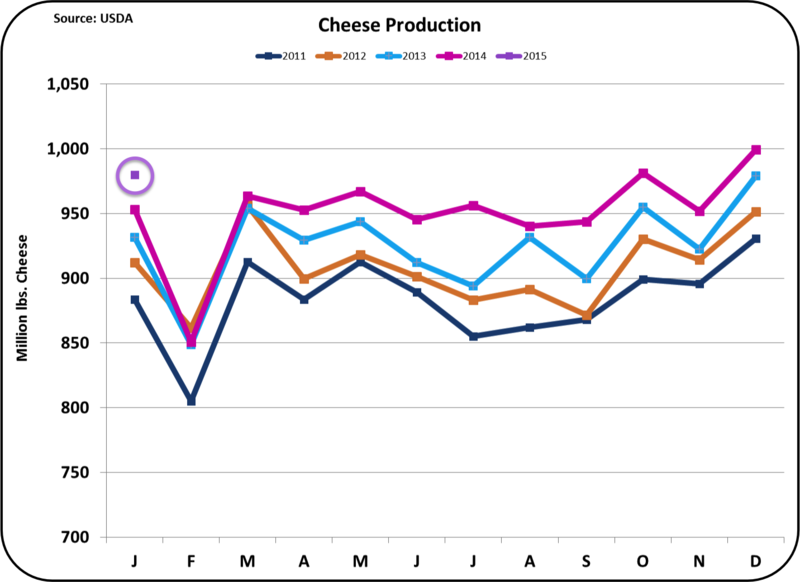 Cheese production was an all time record for the month of January as shown in the chart below. Butter inventories are again showing tightness. While they are above 2014 levels, they are well below 2012/13 levels. 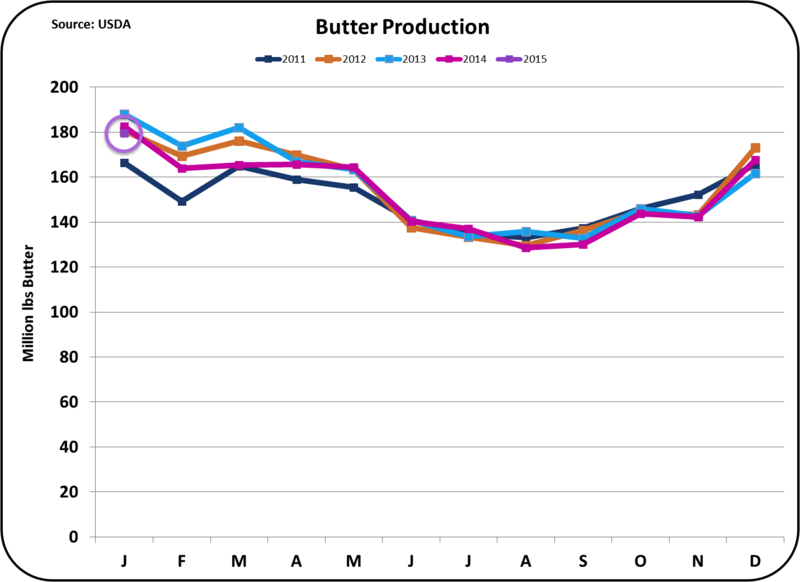 Butter production has remained very stable in spite of a full year's pattern of low inventories. 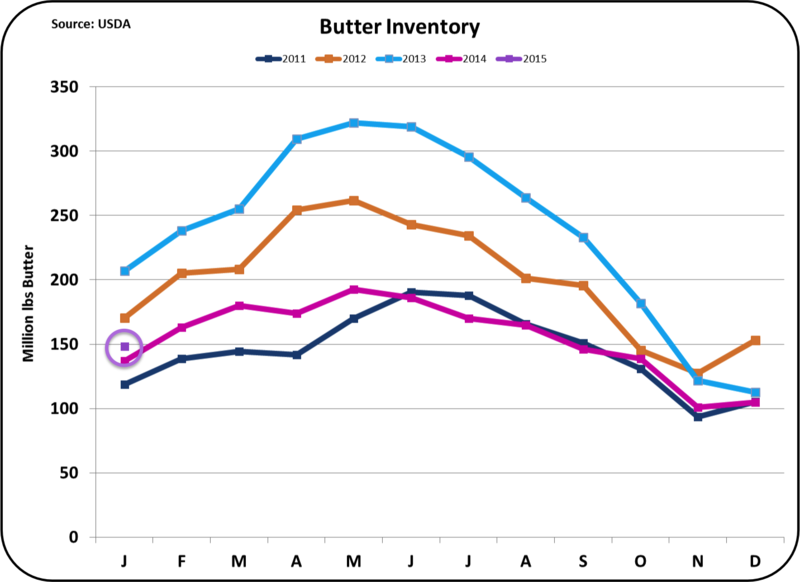 The current price of butter reflects the low inventories and stable production. Dry Whey is the basis for pricing other solids. The majority is exported, domestic pricing is strongly influenced by international pricing and exchange rates. As of December, whey exports were still reasonably strong, but prices were falling. 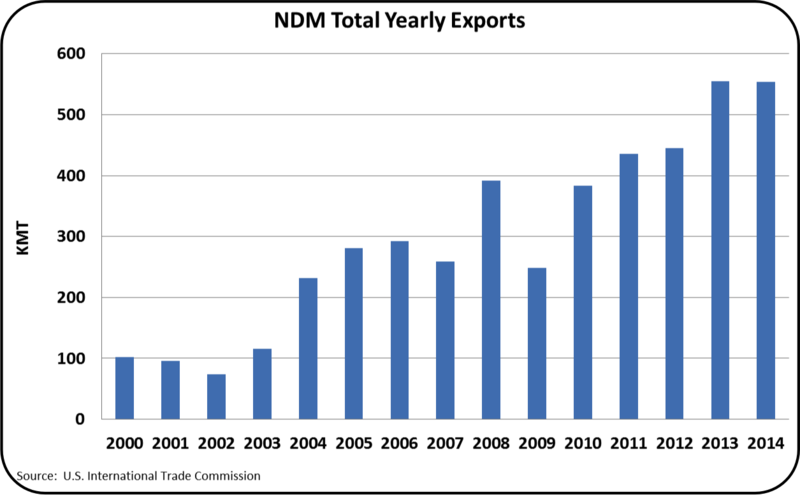 The U.S. remains the leader in Nonfat Dry Milk/Skim Milk Powder exports. However, export volume was down slightly for the year 2014 and prices were down by 50% for the first two months of 2015. 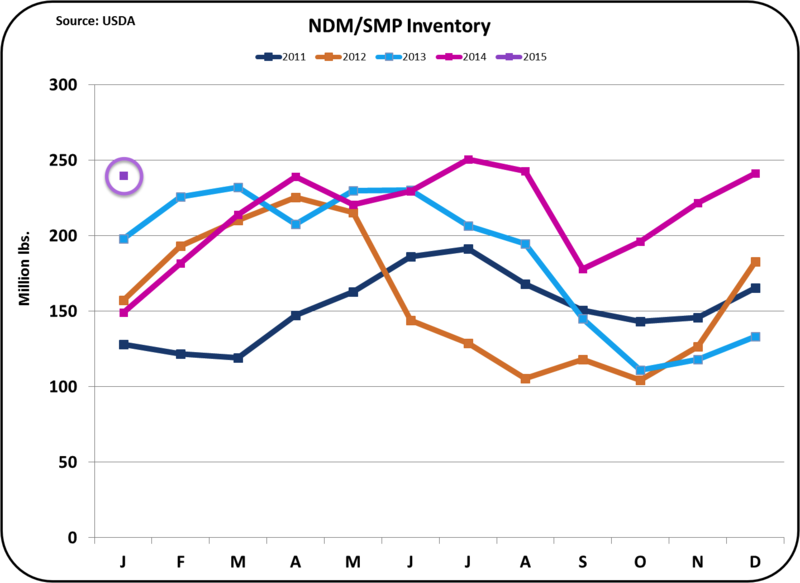 As of the end of January, inventories of NDM/SMP were at record highs. There is real concern here for future pricing. 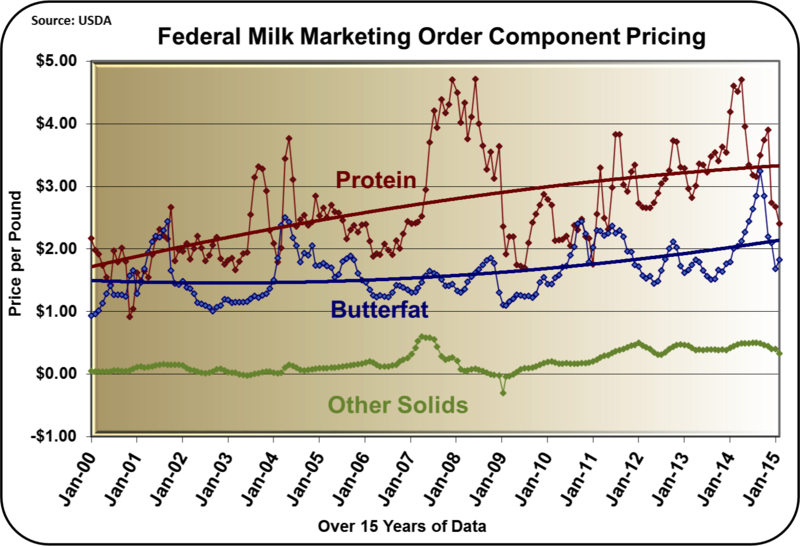 The impact of NDM/SMP pricing is not as direct as for cheese, butter, and dry whey, but there is a mathematical linkage as explained in the July 2014 post to this blog. Whole Milk Powder is a developing market. There are no mathematical links between WMP pricing and producer milk prices, however the international market for WMP is huge and it is being followed in the blog as the U.S. enters this market segment. Because there is no domestic market for this product, pricing, production, and inventories are wholly at the whims of the international markets. New Zealand is the major exporter and China is the major importer. Inventories are very volatile and as of year end 2014, were very high. However, exports of WMP were up 40% in 2014 vs. 2013. If this U.S. export market for WMP continues to grow, it can become a significant user of milk, thereby increasing overall demand. The most concerning element is the drop in NASS cheese prices as this is the primary mathematical link to the Class III milk price. (see the April 2009 post for a review of this important relationship.) If cheese exports remain strong, concerns about the price of cheese should dissipate. Additionally, if that happens, the Class III price will also see a significant rebound.